Bushnell E3956 Elite 3-9x50 Firefly Reticle Riflescope E3956 FREE SHIPPING! The Bushnell Elite 3-9x50 is a versatile riflescope optimized for low light shooting, but capable of excellent performance in any lighting conditions. It features the illuminated Firefly reticle, which charges up from a quick exposure to your flashlight instead of relying on batteries that can give out at the worst possible time. Its fully multi-coated optics minimize reflection to make the most efficient use of incoming light, providing a clear, bright, high-resolution image. It also features a Rainguard HD hydrophobic coating that breaks up water droplets, reducing light scattering for continued visibility in wet conditions. The durable aluminum one-piece tube is tested against 10,000 rounds of .375 H&H for recoil resistance, and also comes with an argon fill that makes it completely impervious to water. 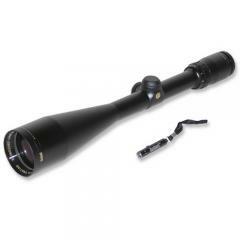 ©2002-2019 CopsPlus.com: Bushnell E3956 Elite 3-9x50 Firefly Reticle Riflescope E3956 FREE SHIPPING!